Before we get too far on discussing last night’s game, let’s take a moment and look at a beautiful piece of art. For one night, the cosmic tumblers have clicked into place and sanity, so lacking over the last few months, has returned to our world. There’s no guarantee on how long this will last (past Tuesday night, at least) so enjoy the moment. Baseball returned to us last night and it did so in thrilling, but somewhat familiar fashion. After all, the Cardinals didn’t get their first hit with a runner in scoring position until the ninth. We’ve been there. Carlos Martinez was dominant and completely worthy of this opening start. Been there as well. And Mike Matheny made some hugely questionable decisions regarding his bullpen. It’s like we never left. Let’s get the good stuff out of the way before we break down what I think were the key moments when things could have been different last night. For much of the game, it looked like it was obvious who the Hero and Goat were going to be. (By the way, if you are just joining the blog this season, a quick explanation: every game I pick one player as the Hero and one player as the Goat. Usually it’s who had the best or worst game, but key moments can produce either one as well. You can find a running total plus who got the overall award for the last nine season below the links over here.) Martinez was amazing, holding down a very powerful Cubs lineup to just six hits, two of which came in the first frame and two of which came after he probably should have been pulled (more on that soon). He struck out 10 and seemed in command all night. Ask Kris Bryant about how well Martinez was going. Bryant, the reigning MVP, didn’t put a ball in play until after Martinez had left the ballgame. On the flip side, Jhonny Peralta was installed in the cleanup spot and looked pretty rough, striking out in his first three plate appearances. Peralta’s antics were particularly painful because The Three Amigos (Dexter Fowler, Aledmys Diaz, Matt Carpenter) were doing what they are supposed to do, which is get on base. Peralta had at least one runner on in each of those times up but couldn’t do anything with it, twice ending the inning with a K. Until the ninth, everything was fine and dandy. You could also give a share of the Goat (if we did such things) to Matt Carpenter. Most of his first night as official first baseman of the St. Louis Cardinals was uneventful, but with a runner on first in the ninth inning, old friend Jason Heyward hit a little chopper to first. Instead of taking the out in a 3-0 game, leaving the Cubs just one out to get, Carpenter first looked to second to see if they had a force there, then lost the handle on the ball in his glove, allowing Heyward to beat it out. One batter later, Wilson Contreras took Oh deep, tying the game. If you get the out there, at worst the Cards are still up by one if Contreras still goes yard. At best, with two outs, Oh focuses and gets the grounder and everyone goes home happy. Thank goodness for Randal Grichuk getting hit on the hand. That’s a strange sentence to type, but if Grichuk hadn’t been plunked at the end of spring training, it seems very unlikely that he’d have been hitting eighth and it’s possible he wouldn’t have been the Hero of our story last night. Grichuk smashed a two-run homer in the eighth inning against Pedro Strop and then walked it off in the ninth against Mike Montgomery. Grichuk also put together some good at bats early in the game, even though they didn’t wind up with great results. If you want to base it on one game, it really looks like Grichuk has stepped up his game and perhaps figured out the contact thing a little more. Not saying he’s going to hit .300 or anything, but his overall night was encouraging. Speaking of encouraging, the person that batted before Grichuk in the ninth was Kolten Wong, who had come in as a pinch-hitter for starter Jedd Gyorko when Jon Lester left the game and it was safe for a lefty to enter. Montgomery is a lefty, which meant Wong was at the handedness disadvantage there in the ninth with two on and a chance to win the game. Unlike some times when feels like he has to be the hero, Wong stayed disciplined and worked the walk, setting it up for Grichuk’s heroics. The rest of his outing wasn’t overwhelming, but you take the good where you can find it. Kudos to Diaz as well for continuing his strong spring and getting a good start at alleviating one-hit-wonder worries. Not only did Diaz get two hits, including the team’s first extra-base knock of the year, he stole two bases against Lester, one of the few that was able to take full advantage of Lester’s issues with base runners. Wong and Stephen Piscotty had seven steals to lead the team last year. Maybe this new focus on baserunning is actually going to happen! There was a lot going on in this game, but let’s start talking about three different Matheny decisions. If the Cardinals had started out with a loss last night, any one of these could have been the reason. Sixth inning, two outs, bases loaded. As noted, Martinez was cruising along in this game, but the offense wasn’t getting the hit he needed. The Cardinals continued to put runners in scoring position but they continued to leave them there. The one run that did score, like the first run they scored in the spring, was Fowler scoring on a Carpenter sacrifice fly. In the sixth, though, Yadier Molina singled and Piscotty walked. After Wong grounded into a force out, Grichuk walked to fill the bags and bring up Martinez to hit. Martinez was at about 85 pitches right then, so there’s the question: do you hit for Martinez and let the bullpen cover the last three frames or do you let Martinez bat because he’s going well and you want another inning out of him? I mean, you do have Matt Adams on the bench, who had a strong spring. The Cubs might have gone to a lefty reliever, but they had just brought Carl Edwards Jr. into the game and I don’t think that they had anyone warming up. They may not have had a chance to counter. My initial feeling was to leave Martinez in the game, but I understand and don’t really disagree with the idea of hitting for him there. Martinez actually put together a good AB–probably too good, as his sharp grounder turned into a double play. Some argued that Martinez should have just taken strike three and let Fowler hit with two outs and the bases loaded, but I don’t know. Fowler was a better shot at getting a hit, of course, but two outs limits the options. Then again, Edwards didn’t look good at all–without the stroke of luck that his wild pitch immediately caromed right back to home plate, one run would have scored anyway–and maybe that would have been the better option. Flip side, if Martinez actually gets a flare to drop, which isn’t unthinkable, two runs score and the Cubs are on the ropes. It didn’t work out, but I think this is the most defensible of Matheny’s moments. Eighth inning, nobody out, nobody on. Martinez ran through the seventh without much of an issue, though when Addison Russell singled Brett Cecil got up in the bullpen. At 97 pitches, it seemed like Martinez’s night was through. Seven scoreless frames is about as much as you can expect from a starter these days and there’s a fully rested pen out there that should be able to get six outs. Instead, Matheny sends Martinez back out there. I can understand perhaps not sending Cecil out since there were a lot of right-handed bats coming up (not that Cecil can’t face righties, just that you’d want him to face a majority of lefties to be most effective) but literally everyone down there was available. Kevin Siegrist is supposed to be the eighth inning guy, right? Why not use him, especially since he’s been better against righties than lefties in his career anyway? I can see not wanting to toss Jonathan Broxton or Sam Tuivailala in that situation, but Matt Bowman’s done a fine job in those situations before. I’d even not squawked if Miguel Socolovich had come into the game there, though that’d have been pretty surprising. There was only the tiniest of chances that Martinez makes it through the eighth. He doesn’t need to be out there for 110 pitches in the first game of the year. Unsurprisingly, Martinez’s effectiveness was not quite there. Eighth inning, two on, one out. Martinez allowed a leadoff single, got a popout, then gave up a single. Matheny finally realized that he had a bullpen and went to get Martinez. Did he bring in Siegrist? Did he go to Cecil, given that Kyle Schwarber was up next and Anthony Rizzo was looming? Oh no he didn’t. Perhaps being confused with all the pomp and circumstance and thinking it was the playoffs, Matheny went to his closer. There are times that bringing Oh out for a multi-inning save makes sense, but I’m not sure that this was one of those times. It wasn’t him facing the bottom of the lineup in either frame. This was Oh going through the heart of the Cubs power. Again, this one makes some sense if it wasn’t for the fact that you signed Cecil for just these situations. If the Cubs counter by removing Schwarber from the game, that’s fine. Cecil’s not limited to lefties, as we’ve noted, and that removes a big bat from the late innings. Oh got through the eighth, but as we’ve seen didn’t manage the same luck in the ninth (though Mr. Grichuk make sure he got a win for his efforts, because baseball). I know nobody would have done it, but it would have been interesting if Oh had pitched there and Cecil the ninth, given that Ben Zobrist (a switch hitter) and Jason Heyward were coming up. Right now, if you were to take away one thing from last night, it’s that Mike Matheny doesn’t trust his bullpen. That may not be the case, but it sure looked like it from his decisions. It’s very possible that Matheny got caught up in the moment and put undo emphasis on winning the first game of 162 more. It’s possible that we’ll see better moves going forward. Matheny’s bullpen management has always been one of those things that worries Cardinal fans, though, and last night didn’t relieve those worries one bit. It’s one game, though. Let’s hope the rest of the week and the rest of the season works out better. Baseball likes to tease us, and after waiting six months for real baseball and getting one game last night, we have to wait until tomorrow for another one. There’s lots of games to watch, to be sure, but it’s not quite the same. Tomorrow, Adam Wainwright will go up against Jake Arrieta. I’m sure it was different for Waino to be sitting and watching yesterday, but at least he got to ride in on a truck. (Actually, that probably wasn’t a rare treat–the last time the Cards started at home, Chris Carpenter got the nod, so I don’t think Waino’s had the home opener as well as Opening Day very often.) I think we are all holding our breath with every Wainwright start this year, not exactly sure what we are going to get. A solid outing against a strong team like the Cubs would help us feel a lot better. As for Arrieta, we know that’s going to be a tough matchup for St. Louis. The Cardinals have gotten to him a little bit more than some teams as of late, but for his career he’s 7-2 with a 1.85 ERA in 13 games against the Cards. Last year he was 3-1 with a 2.38 ERA, so he’s trending the wrong way? Maybe? We’ve gone this long and didn’t even mention Molina’s contract extension, but it was right in line with what most of us expected. Three years after this one, $60 million total. That was exactly what I thought and, with the TV money kicking in next year, I don’t see that being an issue. We’ll see how things between him and Carson Kelly work out over the next couple of years, but I think it’s a very good thing that Molina should end his career wearing the birds on the bat. Molina also made history last night, becoming the first player to walk on no pitches. I still think this new intentional walk thing is silly. 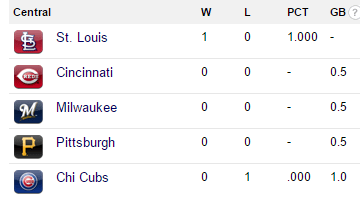 Enjoy the day off and the fact that the Cardinals are in first. It’s a beautiful morning, isn’t it?